Last night, Handsome and I attended a Day of the Dead themed wedding reception here in Baltimore – naturally, costumes were encouraged. At some point early in the month, I had come across this pineapple costume and bookmarked it as a possibility for this or one of the Halloween parties coming up. 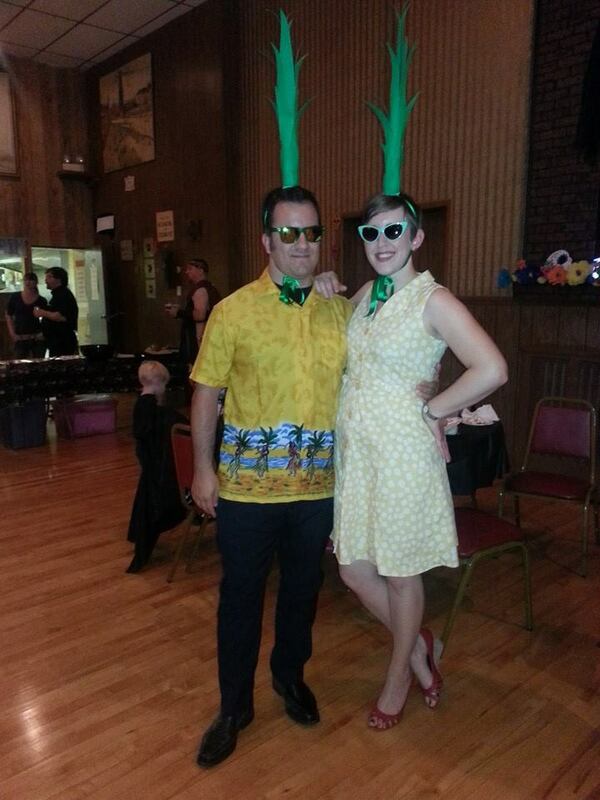 Handsome immediately latched on to this as a fun couples costume for the wedding party (he is a tiki enthusiast, so this is a great costume for him). We found some cheap green sunglasses, a Hawaiian shirt and a yellow dress on Amazon and just had to make the tops. Photo by our obliging pal Margaret Hart. We made the tops the afternoon of the party, finishing them quite literally with just enough time to get dressed and leave. So, this is an excellent last-minute costume if you’re still looking for some inspiration! The Studio DIY instructions linked above call for hot glue, but as neither of us has a hot glue gun, we used rubber cement, which worked out well. Round up some rubber bands before you start, as we found they were very helpful in holding the leaves in place as the glue set. Not sure that you’d need this with hot glue, but it can’t hurt to have them ready. The instructions call for a headband, but mention in passing that it turned out a ribbon was more stable. 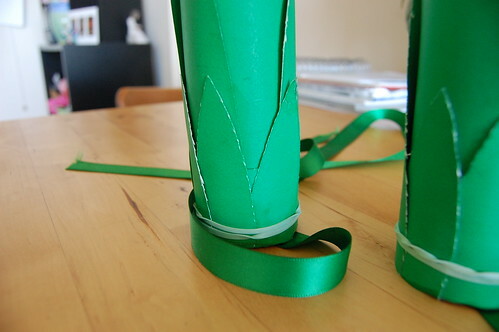 So, we picked up some green, 5/8″ fabric ribbon, and as a first step stapled two long lengths to the inside of each of the tubes. (Three staples on each ribbon seemed pretty stable.) To keep them out of the way while we glued the leaves on, I bundled them up with twist ties (rubber bands would also work here) and shoved them inside the tubes. I found that running the ties behind the ears and under the chin was the most stable way to keep the thing on my head. An unforseen bonus of using ribbons was that when we went to a local bar after the reception, I was able to simply tie them onto a purse handle! We followed the guidelines for the size and number of leaves in the instructions, and cut them all out at once. However, we did not wind up using all of them. If you’re doing this far enough in advance that you can take your time, and/or want to try to conserve poster board for other uses, I’d recommend cutting out each layer of leaves as you go, so you can figure out how many and what length of each you actually want. We had one whole set of leaves we wound up leaving off, and didn’t use all of the ones we cut for some other lengths. We had to hold the leaves in place as the glue set, otherwise the edges would peel up – this is where the rubber bands came in handy. We’d glue on a set of leaves, attach three rubber bands spaced along the portion with the glue, and let it set while we did the leaves on the other tube. By the time we came back to a tube, the previous layer was fixed in place well enough, though again the edges were often starting to peel up. Once Handsome was done cutting the leaves out, we were able to work together to glue all the leaves of one length onto one tube, and then rubber band it and do the same on the other tube. That worked out pretty well, as Handsome could hold the glued leaves in place on the tube while I applied each leaf, and then hold it while I rubber banded. 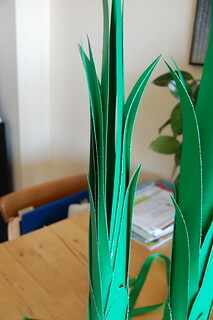 This didn’t work with the very last layer of small leaves, though – there were too many of them to hold in place. First, we wound up cutting those down so they were much narrower as they overlapped too much. Next, we cut a narrow strip of posterboard that was long enough to just wrap around the tube, glued the leaves to that, and then glued the strip to the tube. This was way easier and faster than the leaf-by-leaf method! I’m not entirely sure it’d work as a method for doing all the leaves, but it’s a good way to do this last layer. You can see a bit of the strip used to attach the last set of leaves on that one on the left. We left those green rubber bands on while we wore these out, because that last layer of glue had less than an hour to set before we were wearing these. One thing to keep in mind as you’re gluing leaves is that while you’re placing them, you want to look at where they are positioned about halfway up the top – not at the bottom! This is trickier than it seems as your focus is on the bottom, where you’re gluing. We wound up with a weird gap on one of the tops; Handsome was trying to pay attention to this as we glued, but I think the leaves slipped around before they set. Here you can see the gap. The other side of this one was fine, so I just made sure to put this part in the back when I tied the topper on. We managed to avoid doing this on the other one. Overall, this was a really fun costume to wear and people thought it was great. It’s just conceptual enough that you can make it work with whatever yellow clothes you already own or can quickly find, but not so conceptual that no one will get it when you walk in. We did not win the costume contest, though we did make it to the second round. (No one can compete with two Ghostbusters spraying silly string at the Stay-Puft Marshmallow Man.) Don’t skip the sunglasses, though, those really make the costume work.